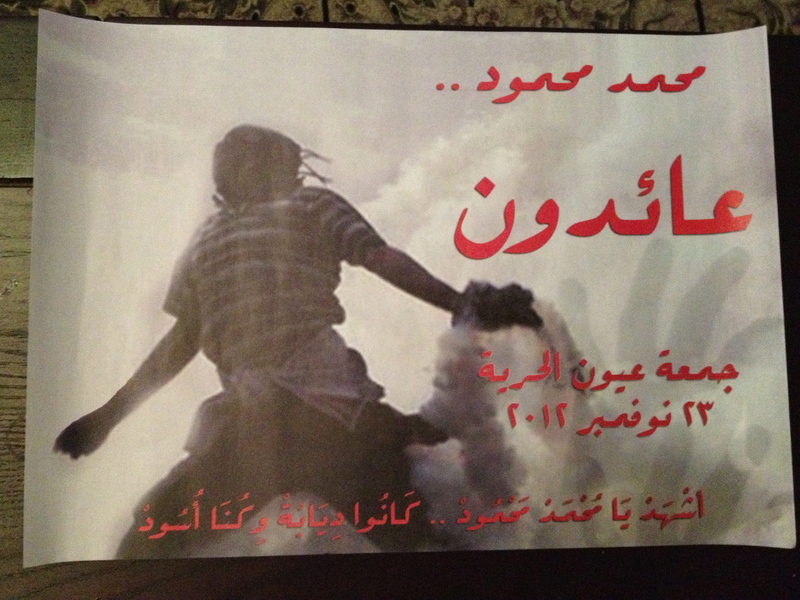 Poster for this Friday's demonstration on Mohamed Mahmoud Street, off Tahrir Square. When I wrote about the demonstrations in Cairo back in September…Thanksgiving seemed so far away. So did the violence. These were mostly strangers to me. And I was a stranger among them. At that time, I walked into a bit of tear gas, but I also walked into great conversations and important steps toward cultural understanding. These protests seemed removed from my experience. I mostly watched the live streaming on my friend’s tv and it was over in a matter of hours. Then Greece kicked off. And other places around the world found their peaceful demonstrations turning to violence, not just here. This week of turmoil in Cairo seems much different. Feels like it’s hitting home. Because some of those strangers became friends over the last couple months, and now here we are together. Cairo liberals are back to Mohammad Mahmoud Street. Remembering what happened here last year. For the sake of the martyrs. Those who lost their eyes. Those who lost their lives. U.S. EMBASSY CAIRO SECURITY NOTIFICATION, 19 November 2012: Embassy Cairo wishes to inform U.S. citizens of ongoing protests and small scattered clashes in the area of Tahrir Square near Mohammad Mahmoud Street, including near the Embassy perimeter. This gathering is connected to calls by liberal groups to march to Mohamad Mahmoud Street today (and possibly through Friday) in recognition of the one year anniversary of the clashes near the Ministry of Interior that resulted in numerous casualties. In addition to potential violence associated with this demonstration, traffic congestion may result in seeking alternate routes. Because of the potential danger associated with the clashes, personnel have been advised to temporarily avoid pedestrian movements outside the Embassy perimeter, exercise caution when driving in the downtown area, and to avoid the Sadat Metro Station until further notice. People are on Mohammad Mahmoud to make way for some sort of version for the future. Some of whom are my friends. The day starts out with boisterous drumming and peaceful, chanting marches. Many children and families. Their flags and banners fly into the evening. 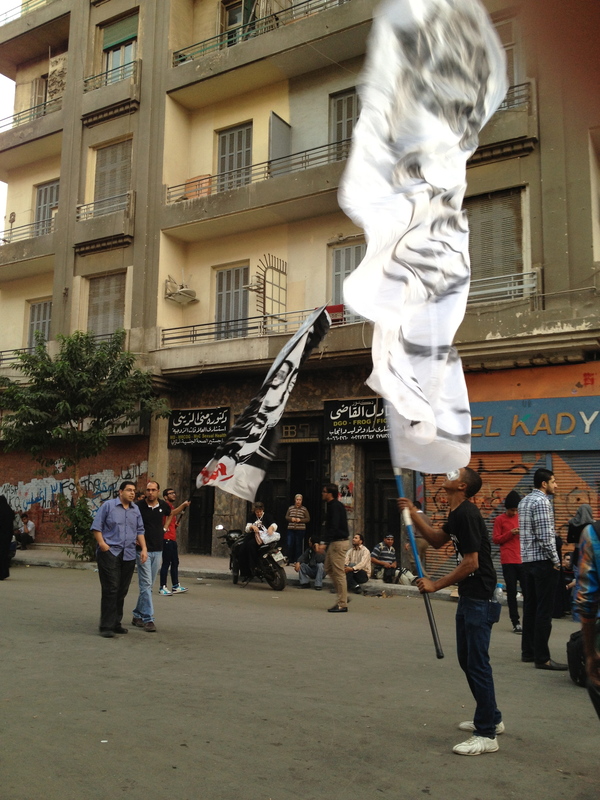 Demonstrator with banner and eyepatch in honor of the Mohamed Mahmoud Street martyrs from November 2011. Young men climb atop the blockade walls, attempting to push down each of the giant concrete blocks. The blocks hit the ground in a dusty crash and the crowd roars. But it’s peaceful. Steps away, cotton candy is for sale. No pictures please because they don’t want anyone arrested: the prisons here are known for torture. Somewhere else down the road, the situation escalates and somebody’s sons feel brave enough (or have enough pent up anger) to step up to the front line and start hurling rocks. Eight trucks of police make their way to the square. I eat ice cream and go back to read in my apartment. 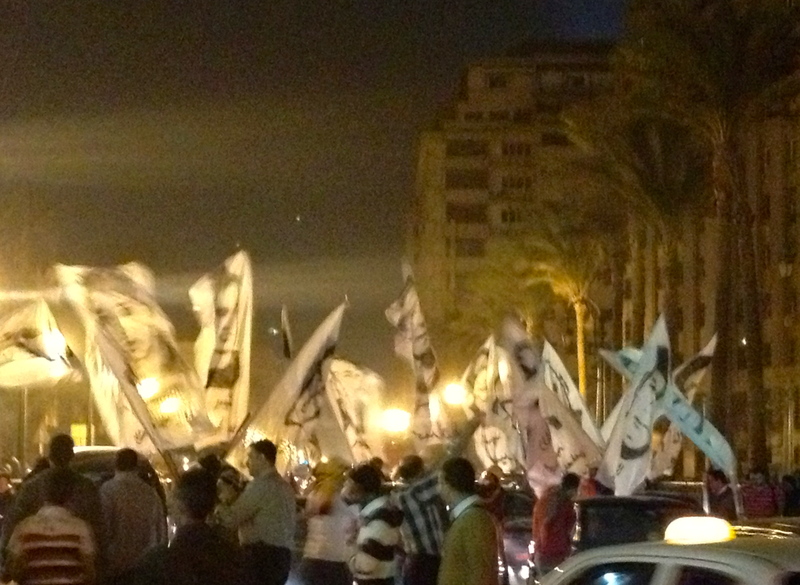 A march across Tahrir Square with banners of the martyrs. The next day, after dinner, I hear shots being fired. Maybe rubber. I see smoke. Maybe tear gas. I hear screams and pounding. Maybe those young boys. My friend and I walk peacefully and somberly to get me to Arabic class. And the media focuses their cameras to the other side of the square, where big wigs from Hamas/Israel/Egypt are playing political games with their people and Secretary Hillary Clinton will soon make her secret entrance. So strange. I went back to my apartment and there is not a single policeman guarding the embassies near my place. This is a first. They are always there. They must have been needed in the square. Oh my. This is all in preparation for Friday. The big demonstration. People vow they will be on Mohammad Mahmoud every day until then. I hope that Black Friday here is productive, not violent, not a tangent. No more rocks and colorless tear gas. I hope for liberal collaboration and progress, for their voices to be heard and to be strong against bigotry/discrimination/conservatism by the current administration, constitutional assembly, and parliament. A somber and tense week when it seems that, once again, the future of Egypt is on the line. Poster for this Friday’s demonstration on Mohamed Mahmoud Street, off Tahrir Square. But the world is not focused on this action in Egypt right now. I have seen very few media. It’s not about Egypt. Or even Syria. All eyes on Tel Aviv and Gaza City. All eyes on the Palestinian and Israeli figure heads here in Cairo. All eyes on the U.S. economy kicking off Christmas season. How will you spend this Friday? Shopping for your loved ones? Stocking up on gifts and necessities at discount prices? Trying desperately to steer your beloved country in a better direction? Supporting a striking Walmart employee? Trying to get a local shop into the black? Hugging your kid? Sleeping off the Thanksgiving turkey or koshary? We will all be doing something or other. I will spend my Friday, not in Cairo, but traveling to Minia with a cohort of Fulbrighters for a Commission-sponsored trip. I will monitor what is happening here, there, and where you are. Do the same for me. P.S. I wish you a happy Thanksgiving. May your Black Friday be filled with goodness. I am so thankful to be here. There is a lot of attention being paid to Secretary Clinton’s visit and her work in the region. It is really the only news outside of the holiday madness – there is a sense of now or never – given that Hilary is planning on leaving. This cycle of conversation has been documented across so many administrations and numerous attempts that then cycle into disfunction or complete breakdown. I hope that it is a peaceful demonstration on Friday and you come back to a peaceful Cairo… Safe travels! I sense your somber tension, as you make it real for all of us who read your posts. Thank you and Take care. We will miss you at our Thanksgiving table tomorrow, Shawn. One thing I am grateful for this year are your posts that give me an insider’s view of what is happening in your neck of the woods. Everything where you are is that much more important and real to me these days. Thank you for that. As always, be safe. All our love from Chicago. Beautiful pics, beautiful words. It makes one wodenr how many time Egypt has seen uprisings and drama and yet somethings always withstand the changes of time, like the pyramids. It sort of puts it in perspective, huh?